INTIO Inc. is introducing SyncVIEW™, a new feature of the 510(k) cleared ClearStart•SVM™ (Segmentation and Volumetric Measurement system), at the Clinical Interventional Oncology (CIO) Symposium in Miami Beach, January 18-19, 2013. 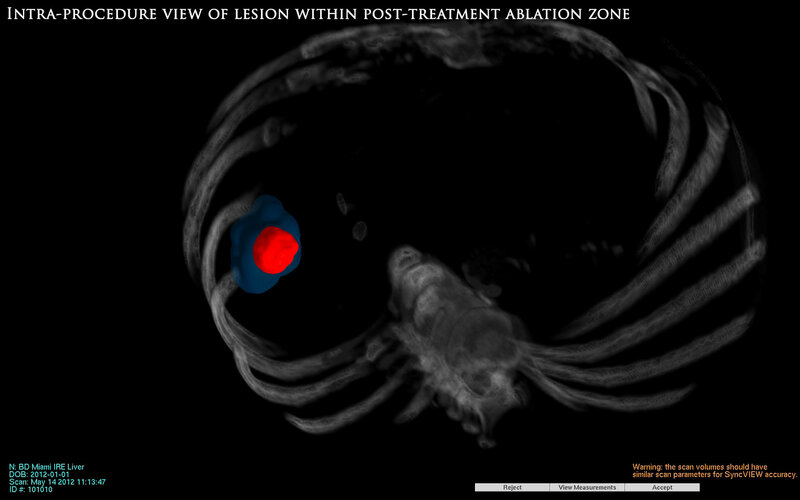 SyncVIEW™ provides the interventional oncologist the unique ability to view the segmented target lesion in conjunction with the post treatment ablation zone, intra-procedurally. This real-time approach removes guesswork, increases accuracy, and reduces procedure time while enhancing confident decision-making in percutaneous CT guided ablation procedures. "… intra-procedural ablation … response assessment – a critical aspect for determining outcomes…"
“INTIO has developed software to semi-automatically measure tumor volume for use not only during intra-procedural ablation but also for response assessment – a critical aspect for determining outcomes but with the added benefit of RECIST measurements automatically calculated for traditional comparisons,” said Morgan Nields, President & CEO of INTIO, Inc. “The ClearStart•SVM™ system allows tumors in the liver to be segmented quickly with an easy to use semi-automatic algorithm. SVM’s accuracy has been validated in explant studies for both liver cancer and metastatic disease. SyncVIEW™ leverages the ability to accurately segment the target lesion during a CT guided ablation procedure and enables improved visualization of the target tumor with probes in place while allowing tumor margins to be determined in 3D at the end of the ablation procedure,” Nields concluded. ClearStart SVM™ is currently installed at more than a dozen major cancer centers across the U.S. Deliveries with the SyncVIEW™ feature will begin in February 2013. INTIO is a venture-backed company founded in 2005, based in Broomfield, Colorado. The company’s focus is on all interventional oncologic therapies including surgery, ablation, chemoembolization, radioembolization as well as palliation for pain. For more information, contact Jorge Lopez, Vice President of Sales & Marketing. INTIO will be demonstrating the ClearStartSVM™ system and SyncVIEW™ feature at the CIO Symposium, in Booth #300. Video: "As seen on PRWeb"